Brad, you are a man after my own heart...too many pens, too many inks, and loving them all. I am a big fan of Esterbrook Dollar, Transitional, and J Series pens and have a few. Your Esterbrook J Clergy is really interesting. Do you have any idea of its history? Thanks for sharing. Those pens are great. 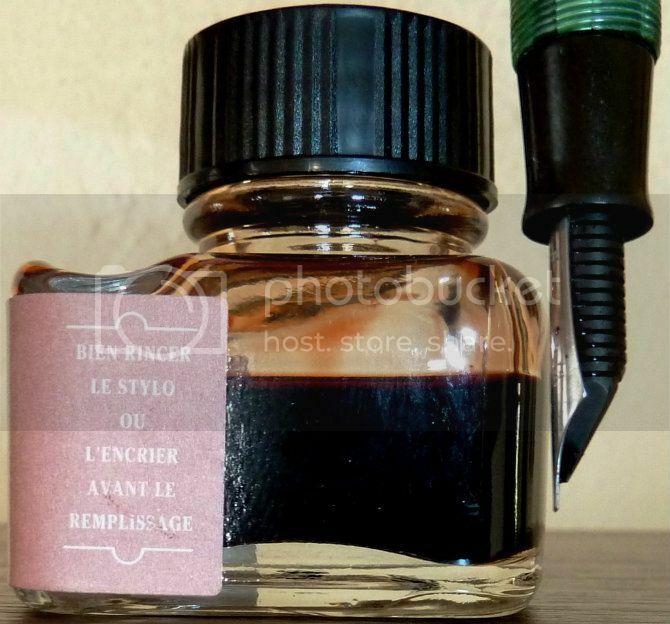 By the way, I, too, like the J. Herbin Poussière de Lune ink and own a bottle. I do find the J. Herbin ink bottles way too shallow, however. 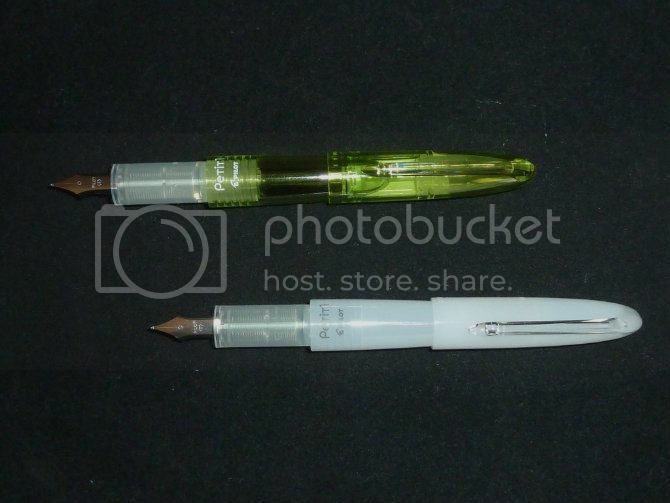 After a few fills, it becomes difficult to fill a pen because the ink in the bottle no longer covers the nib and feed and more air than ink gets into the bladder. See the photograph. This ink is J. Herbin's Rouille d'Ancre, another favorite. It is a pink leaning towards brown and is actually more earthy than in your face, as so many pink shades are. (07-27-2012, 01:36 PM)freddy Wrote: Brad, you are a man after my own heart...too many pens, too many inks, and loving them all. The Esterbrook Clergy,I researched it's history a little. It was made at the factory supposedly for the Catholic church. There are others out there were added after market. It has been determined that mine is original because it is a double inlaid cross. J Herbin inks do make it difficult to load when the ink level becomes low. Currently my favorite brands are Diamine and Rohre-Klingner inks. I do want to try the newest ink Organic. Brad, I love the Diamine inks. Have you tried the Grey, Oxblood, Syrah, Denim, and Eau de Nil? They are my current favorites in the Diamine range. I am a member of the Goulet's Ink Drop and so got to sample some of the R-K inks and have to admit that the colors just did not excite me. I'm not quite sure why as they seem to have quite a following. I'm hoping that some of the new Organics will find their way to an Ink Drop sometime in the next couple of months. Thanks for the information about the Esterbrook J Clergy. I have been playing with the dip pen that I got in Venice last month (see the photo on page 1 of this thread). I am really having fun with it and it is the first dip pen I have been able to use with even moderate success. What I have found most fascinating is how my penmanship has to change a bit to use it. In these writing samples, the top one was written with the dip pen (somewhat flexible fine nib) and Noodler's Black American Eel ink while the bottom version is written with my TWSBI Diamond 540 (fine nib) fountain pen using Diamine Grey ink. The dip pen makes for more stilted writing, which I have noticed on some old samples of a century or more ago that I have seen. 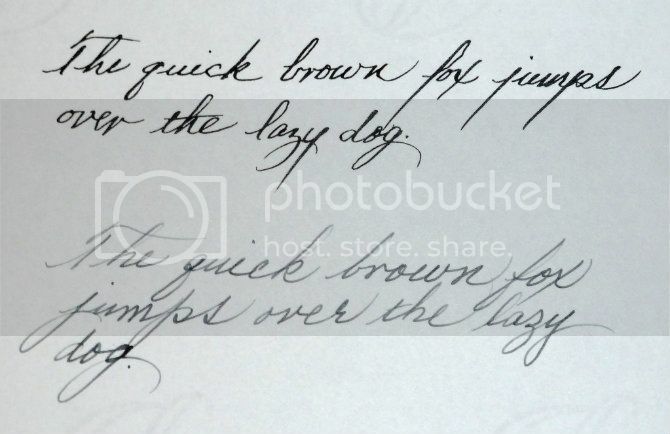 It is easier to just leave some descenders at the bottom, pick up the pen, and start again at mid line. This can be seen in the f, j, p, and y. The smooth flow of the fountain pen allows me to loop the descenders back up and continue writing. There is obviously a speed advantage with the fountain pen over the dip pen just as there is with a computer over a manual typewriter. Writing full letters to friends using the dip pen has been challenging at times but a whole lot of fun. All these pens are stunning it puts my childhood Parker 21 to shame. Freddy I am always impressed at your penmanship!!! I absolutely love it when you mail a note and it's written with a fountain pen. It makes me feel like I'm extra special that you took the time to do that rather than use a ballpoint. (07-28-2012, 01:33 PM)slantman Wrote: All these pens are stunning it puts my childhood Parker 21 to shame. Jerry, don't knock that Parker 21. 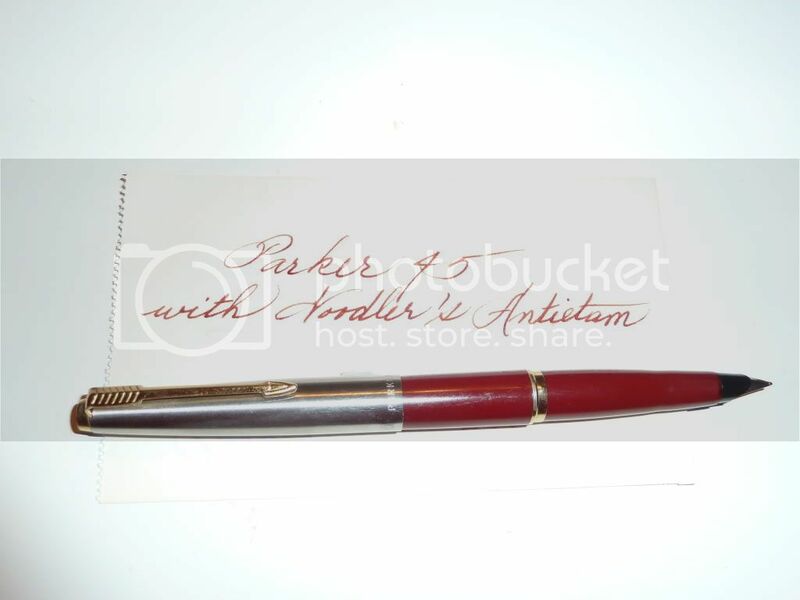 I bought a Parker 45 about the time they came out in 1962. I still have it and it still writes very nicely (though I'd prefer a Fine nib to the Medium that is on it). 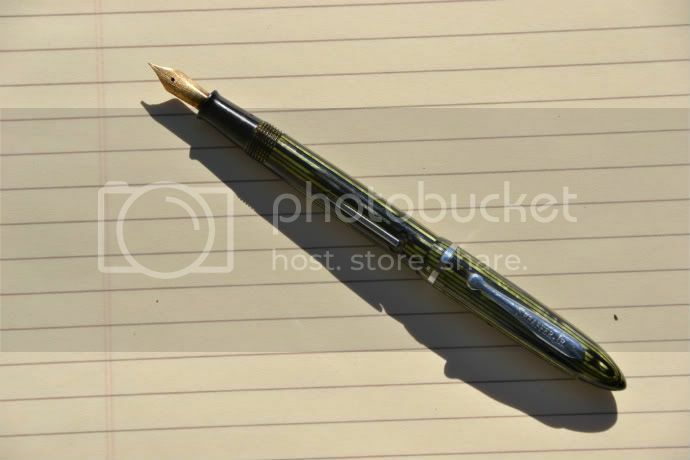 I wonder how many dried up/used up Bic disposable ballpoints have ended up in landfills in the 50 years since, as a teenager, I first walked out of a store in Brooklyn clutching that fountain pen? I have a Parker 21 that writes really well. I have two Parker 45s, one is probably a fine nib that I find a bit scratchy and another which is a nice medium. I can't say that I care that much for the 45's I think they are a bit small for my freakish hands. The 21 feels nice, but I don't usually keep vintage pens inked too often. Hardly any mention of Vintages here. No love for the Pelikans or Parkers? (07-29-2012, 06:44 AM)jerseymike Wrote: Hardly any mention of Vintages here. No love for the Pelikans or Parkers? I love my vintage pens. Among my collection are several Esterbrooks (Dollar, Transitional, J Series, a lever fill Desk Set, and two Dipless Desk Pen sets), a Parker Vacumatic, a Parker 180 Flighter, a Parker 45 (purchased new 50 years ago), a Sheaffer Snorkel, a Sheaffer Defender, a Sheaffer Jr. vac-fill Balance, a Sheaffer Jr. lever fill Balance, a couple of Majestics, and a Moore. I only ink up a few of my pens at a time, though. 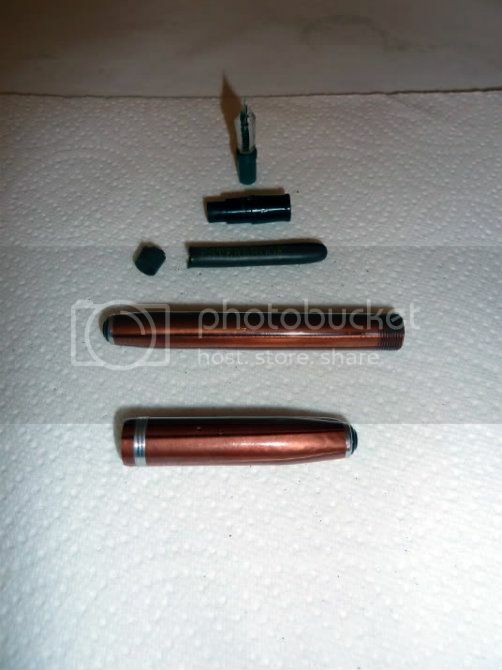 Shown here are a copper Esterbrook SJ broken down for a sac (bladder) restoration, a lever fill Sheaffer Jr. Balance, a Majestic, a Moore Jr., and a Parker 45 (my 1962 high school purchase). I hate having to write a z. But then again, my writing always looks like a 2nd grader. Another sampling of some of my vintage fountain pens. I collect Waterman, Sheaffer and Esterbrook plus others. I do have modern pens too preference is for vintage though. I have a few Estie SJ pens.. but they are just too small for my big clumsy hands. They sure look nice though. Brad, I really like that blue Esterbrook Transitional. 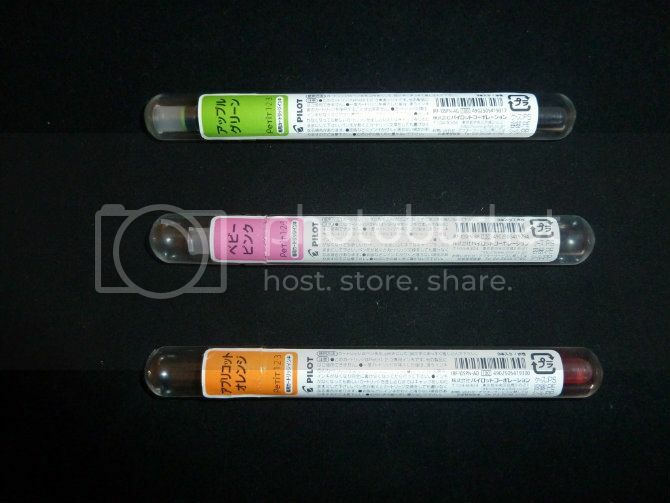 Justin, I'm fortunate in that my hands are pretty small and can use pens like the SJs quite comfortably. I even enjoy very inexpensive modern pens. 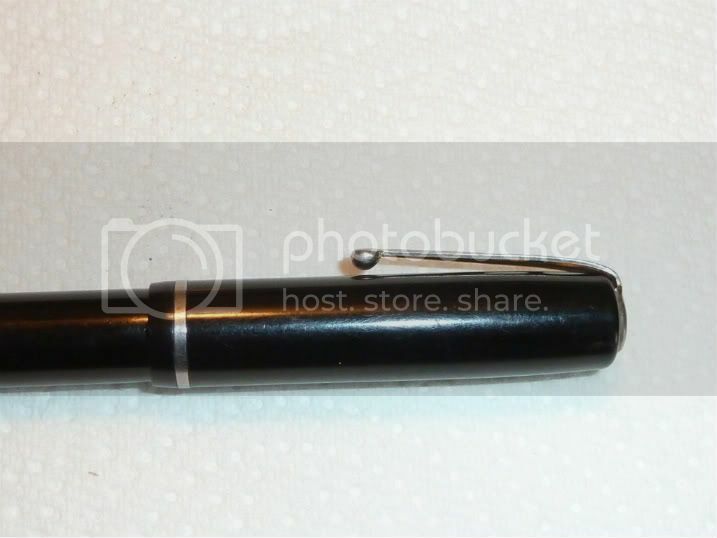 For example, the Pilot Petit pocket/purse pen is a great little writer and fairly smooth for a pen costing less than $4.00. While folks like Justin would probably suffer trying to use one, I find them very convenient and even keep one on my desk ready to go at any time. The only downside is the proprietary cartridges. Esterbrook's plastic are much more durable then some other manufactures. Wow, you gents sure have some magnificent pens! (08-07-2012, 03:39 PM)freddy Wrote: Justin, I'm fortunate in that my hands are pretty small and can use pens like the SJs quite comfortably. I actually have a few of the Petit1's. While I can't use them for a long period of writing, I do like to ink one up every now and then to carry in my shirt pocket for quick notes. I even keep a pink one inked for those times where my daughter wants to use a fountain pen. 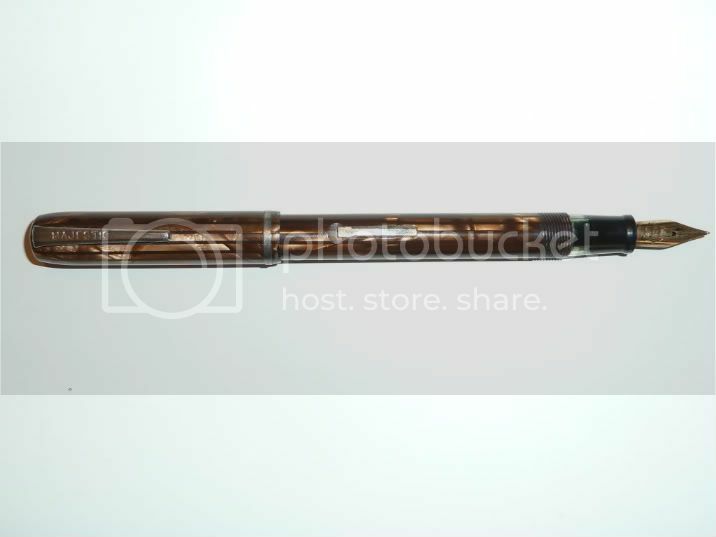 In regards to them being a proprietary cartridge, I will refill the cartridge with a blunt tip syringe. 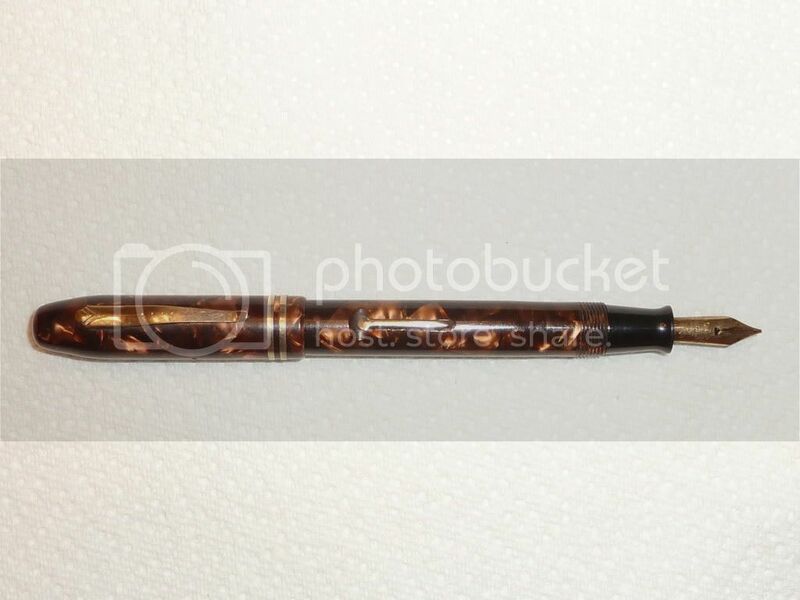 They also make a pretty good eye dropper pen. However, I don't have any of the new model, so the new model may have a hole or something that would make that a bad idea. When ordering from Jetpens, I often would end up at just under $25, so for a while I would just toss one of these on my order to get me up to free shipping. 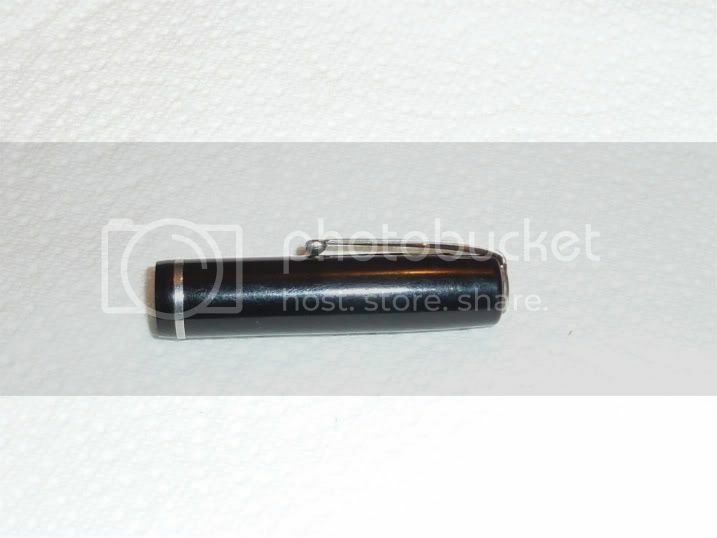 Lately I have been buying the OHTO 2mm lead holders or replacement lead to get me to the shipping goal.